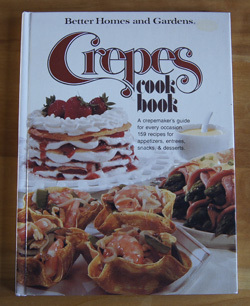 Cookbook #32: Crepes Cook Book. Better Homes and Gardens, Meredith Corporation, 1976. There is only one recipe in this book that I have used a lot: Shrimp Chow Mein Dinner. But looking over the recipes now, I find it easy to find one to try for this blog, and I marked several more to try later. The first pages of the book present crepe cooking instructions. (I only disagree with it on one crepe-making issue: when making the crepe itself, I always cook both sides.) Then it gives a variety of recipes for crepes: main dish, calorie counter’s, buttermilk, cornmeal, Parmesan, whole wheat, sour cream, dessert, chocolate dessert, lemon dessert, and coffee dessert crepes. Basic sauces and fillings come next. I sort of like this, because it encourages you to be creative. However, I wish they would have at least cross-referenced each crepe recipe with the entree/dessert recipes that they are used for in this cookbook. For instance, if I want to find a recipe using “Cornmeal Crepes”, I have to scan each recipe in the book – it has a crummy index that is no help in my search. Recipes that I have marked to try include: Szekeley-Filled Crepes (potato crepes filled with pork), Home-Style Pork Pie Crepes (ground pork in buttermilk crepes), Crepe-Style Manicotti, Beef Enchilada Crepes, and Low-Calorie Cherry Crepes (a dessert crepe). Chinese Mu-hsu-jou Crepes remind me of my Moo Shoo Turkey. The Mu-hsu-jou crepe batter substitutes water for milk. 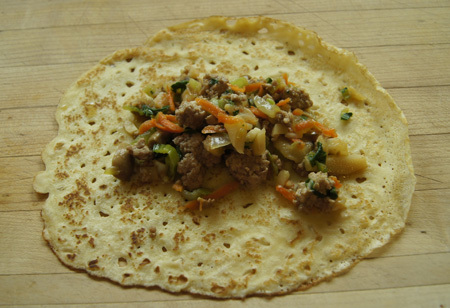 I should try this recipe sometime, since crepes might be better than flour tortillas for moo shoo wraps. A google search reveals that Mu-hsu-jou recipes employ “Mandarin Pancakes” and one recipe I found online for these pancakes is identical to the recipe in my Crepes Cook Book. Intrigued by the use of crepes in Chinese food, I decided to try “Chinese-Style Dinner”. This recipe is an egg roll in a crepe. Egg rolls are usually deep fried, so this seems like a good way to bring a low-fat version of this treat into my repertoire. One more discussion before I get to the Chinese-style dinner. This cook book is pretty good about using fresh ingredients, except for canned shrimp, and frozen asparagus and fish. Whole grains and fresh vegetables are often used. So except for a few fat-laden sauces, the recipes fit into my healthy eating plan. This is funny though: in the Greek-style Crepe Casserole, they suggest that you can substitute American cheese for feta cheese. That’s just silly! Back to the Chinese-Style Dinner. 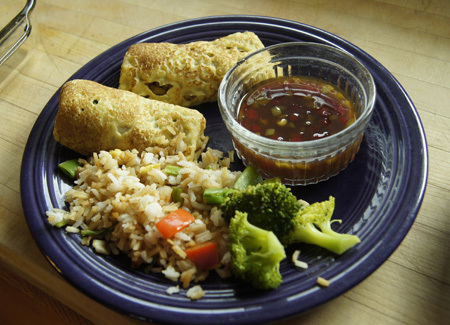 Even though these are not deep-fried like egg rolls, this is not a quick recipe. The ingredient list is long, and you have to chop up seven vegetables and two meats, make crepes, and make one or two sauces. Let’s see if it’s worth the trouble! My version of the recipe (below) is half of the one given in the book. I made the full amount of crepes, though, and used them for breakfast the next couple days. It made seven filled crepes for our meal; we ate all but one. I used some pre-cooked shrimps that I had on hand in the freezer, but I think you could use raw shrimp. I weighed the pork and the shrimp amounts. I was out of fresh mushrooms so I used canned. I like water chestnuts, but this recipe only uses 1/4 cup, which means you will have some leftover – leave them out if this is an issue. The point is, you can be pretty free and creative with what you include in this recipe. 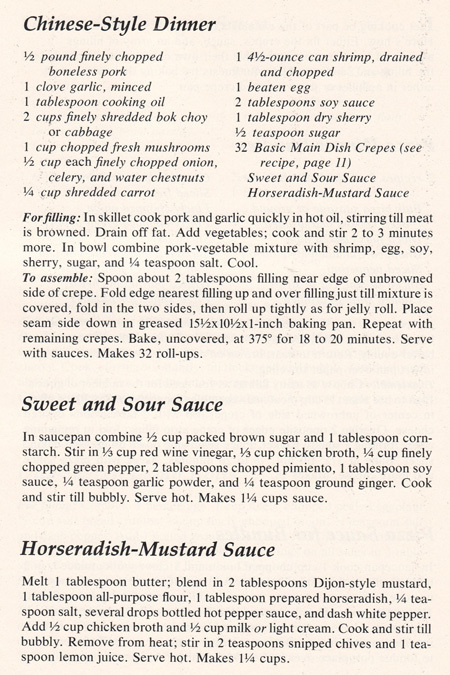 I made only the Sweet and Sour Sauce for these crepes; I suggest you also try the Horseradish-Mustard Sauce as in the scanned-in recipe. Feel free to use a purchased, bottled sweet and sour sauce if you want to save time. For the crepes, put all of the crepe ingredients in a blender and blend on high until well mixed. Scrape down the sides, then let rest an hour or so. Blend again. Heat a pan, coat it with non-stick spray, then pour about 1/3 cup of the batter into the hot pan and tilt the pan so the batter spreads to the edges of the pan. Cook until brown, then flip and briefly cook the other side. I made about 12 crepes from this recipe of batter. For the filling, heat a non-stick pan, then cook the pork until it is browned. Stir in the garlic and cook a minute or so. If necessary, drain off any fat. Add the vegetables and the shrimp and cook and stir 2-3 minutes more. Remove from heat, put in a bowl, allow to cool, then add the egg, soy sauce, sherry, and sugar. For the sauce, combine the brown sugar and cornstarch in a small pan. Stir in the remaining ingredients and cook and stir till bubbly. 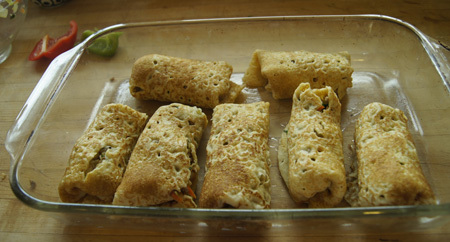 Place the filled crepes seam side down in a non-stick-sprayed baking pan. The recipe says it makes 32 crepes, but I only made 7 with a half-recipe. Guess I stuffed them fuller than they intended. Bake, uncovered, at 375˚ for about 20 minutes. Serve with the Sweet and Sour Sauce. I added my Chinese-style rice and steamed broccoli. These were a big hit! We both really, really liked them and I will make them again. We didn’t try to pick them up, we just poured the sauce over and used a fork. They have more filling than a typical egg roll, and the crepe wrap brings great flavor to the dish. The eggs in the crepe batter bring new meaning to “egg rolls”. Once again, I am glad that I am doing this 250 Cookbooks blog. Another great recipe: Found!